A board showing "Welcome home, boys", is seen after rescue effort has begun for the 12 schoolboys and their soccer coach trapped in Tham Luang cave, in Chiang Rai, Thailand, July 9, 2018. A total of eight boys have now been rescued. The head of the Thai rescue operation told reporters that the mission Monday went smoothly, and has asked for three more days to rescue the remaining four boys and their coach from the Tham Luang caves. The acting governor of Chiang Rai state, Narongsak Osatanakorn, said that divers are unsure whether all five can be rescued in one or more missions. "8 boars in 2 days. Hooyah," the Thai Navy SEALS wrote on their Facebook page Monday, referring to the boys' soccer team, the Wild Boars. Thai Prime Minister Prayuth Chan-ocha arrived in Chiang Rai and visited the eight rescued boys in the hospital Monday night, according to Osatanakorn. The rescued boys were airlifted to the Chiagrai Prachanukroh Hospital in Chiang Rai after initial treatment at a field hospital near the caves, and the four boys rescued Sunday were said to be "in good condition." Police and military personnel use umbrellas to cover around a stretcher near a helicopter and an ambulance at a military airport in Chiang Rai on July 9, 2018, as rescue operations continue for those still trapped inside the cave in Khun Nam Nang Non Forest. Narongsak also said Monday that the condition of the five remaining people in the cave is "still good". Interior Minister Anupong Paojina said the same divers who participated in Sunday's rescue conducted the operation Monday because they are familiar with the cave conditions. The boys and their coach have been stranded about four kilometers inside the cave. Following the initial rescues Sunday, the operation was paused for about 10 hours while divers replenished air tanks along the exit tunnel. 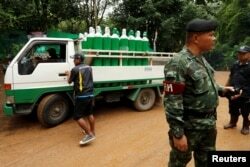 A truck carrying oxygen tanks arrives outside the Tham Luang cave complex, where 12 schoolboys and their soccer coach are trapped inside a flooded cave, in the northern province of Chiang Rai, Thailand, July 8, 2018. Soldiers arrive outside the Tham Luang cave complex in the northern province of Chiang Rai, Thailand, July 8, 2018.